Losing weight is about shedding fat, not muscle. To maximize fat burning, you'll want to strategically combine diet and exercise. You need to reduce calorie intake enough, but not too much, and do two kinds of workouts -- high-intensity interval training and strength training. If you're struggling to lose the fat, consult your doctor or a dietitian to help you design a plan that fits your specific goals and health needs. Eating fewer calories than your body needs forces your body to burn fat for fuel. . Reducing the number of calories you need to maintain your current weight by 500 to 1000 calories a day promotes a 1- to 2-pound weekly weight loss. For example, if you need 2,400 calories a day to maintain your weight, maximize fat loss by limiting your intake to 1,400 to 1,900 calories a day. An online calorie calculator can help you determine your calorie needs, based on information you plug in: your age, weight, height and activity level. However, to prevent a slow down in fat-burning, women should not eat less than 1,200 calories a day and men no less than 1,800 calories a day, so don't go below these levels. Aerobic exercise is a good way to burn calories and fat, but to maximize your body's fat-burning power, you want to include high-intensity interval training, or HIIT. This type of aerobic exercise alternates between periods of fast-paced exercise, followed by a slower-pace for a defined period of time. 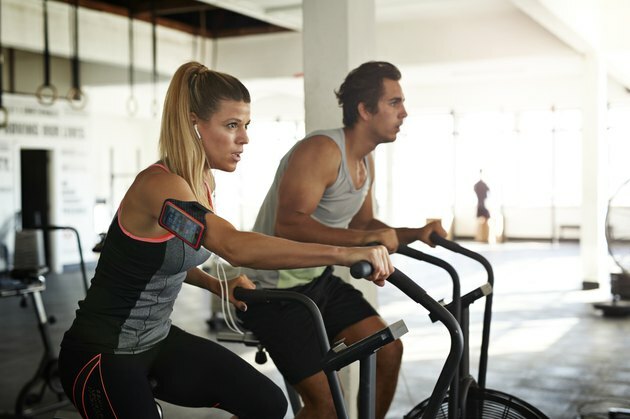 For example, you could cycle as fast as you can at high resistance for 2 minutes, then cycle at a slower pace and lower resistance for 3 minutes, alternating between the two for 30 minutes. HIIT burns abdominal fat while helping you retain muscle mass, according to the American College of Sports Medicine. However, due to the intensity of the workout, it's best to limit HIIT to twice a week. To stay on track with your fat burning, include 30 to 60 minutes of moderate-intensity aerobic exercise, such as a bike ride or swim, on three other days during the week. While you may be working hard to maximize fat burning, when you cut calories, your body may also burn some of your muscle for energy. To minimize muscle loss, include strength-training exercises as part of your fat-burning plan. Working out your muscles not only helps prevent further loss, but may help limit the decline in metabolism dieters often experience as their body weight drops. Because muscle tissue burns more calories than fat tissue, building your lean body mass gives your metabolism a little boost. To gain the greatest number of benefits, work your muscles to the point of near exhaustion, using free weights, weight machines or resistance bands, doing two to three sets consisting of eight to 12 reps each. Plan for two workouts a week, but do them a couple days apart to give your muscles a chance to recover. The debate is still on about whether a low-carb diet or a low-fat diet is better for losing fat and keeping it off. Either way, the quality of the food you eat on a weight-loss diet counts, and making nutritious choices keeps you feeling energetic. Fill your diet with nutrient-rich whole foods such as fruits, vegetables, whole grains, lean sources of protein and low-fat dairy. Processed foods, such as soda, sweets, fried foods and chips, may pack on the fat and should be limited on your fat-burning diet plan. Getting enough protein is also important if you're working out to build muscle. Aim for 0.5 to 0.8 grams per pound of body weight, or 90 to 144 grams for a 180-pound person. Poultry, seafood, eggs, lean red meat, soy foods and beans make good protein options. Can You Gain Muscle on an Elliptical Machine?